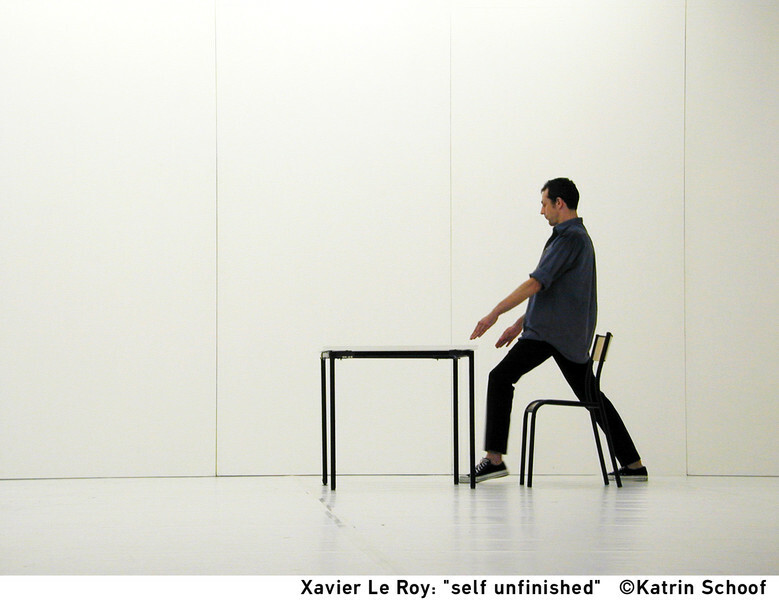 Xavier Le Roy: Self Unfinished | people are dancing here. A few years ago I came across this YouTube video. And I thought: I would really love to see this work live. And then a few days ago, I did. So that was really great. 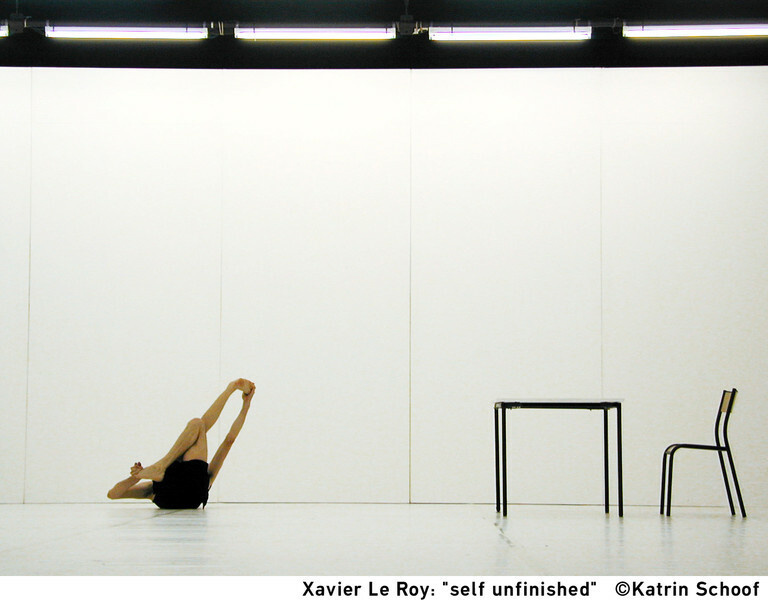 Self Unfinished was choreographed in 1998 by the French choreographer Xavier Le Roy, a choreographer who I am completely in awe of and have a sort of career crush on because he arrived at dance by such an odd route, starting out as molecular biologist and ending up making dances. (You can learn more about that story by watching his full-length piece Product of Circumstances at UbuWeb). I’ve placed him in a certain category I’ve created in my mind called ‘Clever French Choreographers Who Somehow Make More Fun Dances With Less Dance Movement’. It is an awkward and grammatically suspicious name for a category, but in it are also Le Roy’s friends Jérôme Bel and Boris Charmatz. In any case, it was a very exciting thing to watch the work live. It was at the Centre Pompidou in Paris, running at the same time as (or perhaps as apart of) ‘Un Nouveau Festival’ where I had spent the afternoon before the show began. The festival consisted of exhibitions, installations, video dance screenings and a live retrospective sort of performance thing. There was a lot happening in a very friendly way, but at the same time it all seemed quite vast and important and I was mostly confused and overwhelmed. Nodding politely when being spoken to in French catching every third word or so, wide-eyed at the amount of dance around me, excited by the strange curatorship and skimming too quickly over pamphlets in French that explained what was happening and (lacking my dictionary and patience) not really properly understanding the details. So for a large part of the afternoon I was engaging with something that mostly I didn’t understand but enjoying the whole thing thoroughly, feeling very much like a country-bumpkin/child before christmas (which is a very special feeling that you can never get back once you are world-wise, fluent in French and have seen it all already). I arrived at the performance feeling stuffed and mildly hysterical in happy ‘I’ve-eaten-too-much-Art’ kind of way, my brain buzzing and generally mostly exhausted. 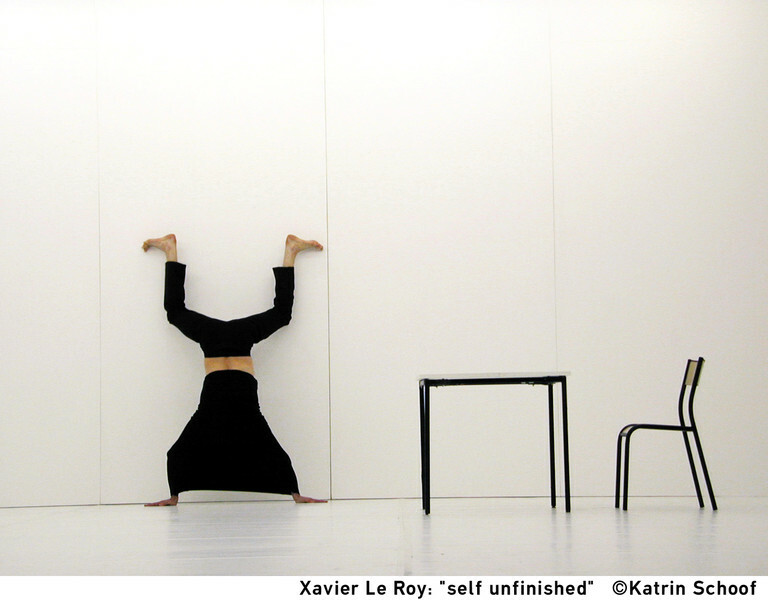 Xavier Le Roy was sitting on a chair, on the practically empty stage, looking almost cross, waiting politely for the audience to enter and settle down. You know the lecturer at university who did not speak until everyone was quiet? Poised, leaning against the desk with relaxed hands over crossed knees, watching us all with distracted interest? It was a little bit like that. If I had not been so worn down by so much art from the afternoon, I might have felt reprimanded at his posture. Instead, I looked at him and wondered about all the science in his brain and if that’s why he makes such nice art. Once we had quietened down and everyone found their seat, he proceeded to start the solo. I feel as though I could get into more detail, explaining the slowness, the concentration, the humour and above all, the way in which the body was stretched out into vast variety and option, reminding us how much bodies are capable of, without that rhetoric of virtuosity. When we get lectured at about how much human minds and bodies are capable of, it is usually a thing of ‘more’ – faster, stronger, smarter, quicker etc. Like we are supposed to go up, but this piece reminds us what bodies are capable of, not in a vertical capacity but in a horizontal capacity, if that makes any sense. 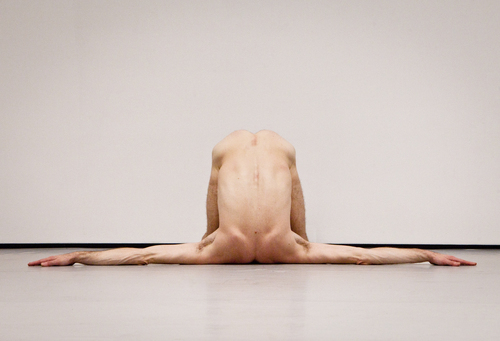 It emphasizes the vast and varied ability of bodies to be several things spread out at the same time, upside down, lying down, perfectly still. It also reminded me that we are all simultaneously so deftly individual and undeniably uniform. But mostly, it reminded me that we are never one thing and I found this massively comforting. And so. If you ever have a chance to catch this show, I suggest you don’t miss it. And also here is quite nice video of Xavier Le Roy speaking about the piece. Pingback: Organs with limbs - >> mind the __ GAP* ?